It was only 41km from Barragem do Arade to Lagos but the one thing we needed most was GAS but we saw none! 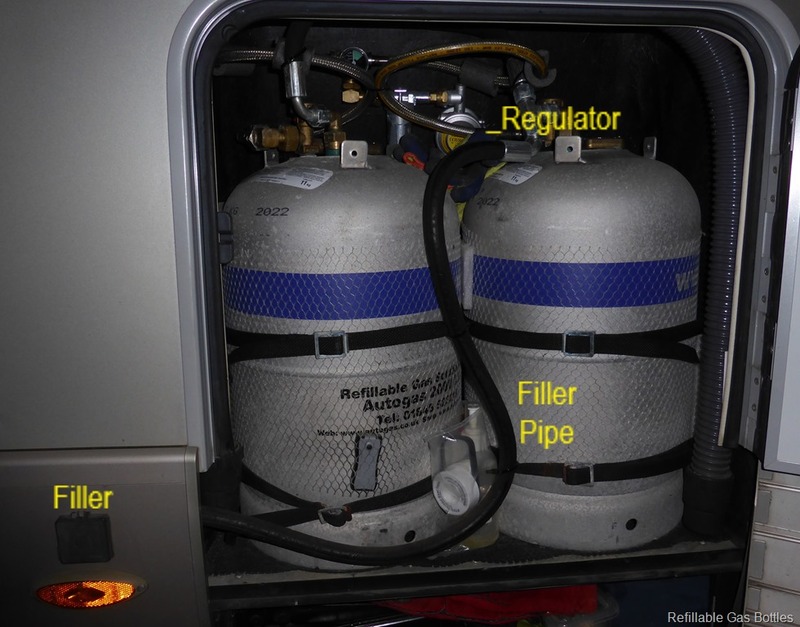 Technical Interlude: Because we travel to and through so many countries and need bottled gas for our cooking, heating and to run the fridge it can become a major problem for Motorhomers. Ideally in summer we need butane as it is the most efficient but in cold weather you can wake up to no heating or (heaven forbid) no morning cuppa! Because butane freezes on a cold morning and will not flow, so in winter we need to use propane because that doesn’t freeze even above the Arctic Circle. But butane and propane comes in different bottles with different fittings and usually a different regulator. Now add into the mix that there is no such thing as a standard gas bottle even in Europe (good ole Europe) apart from the small blue camping gas bottles which are very expensive and are butane. Sometimes every company within each country uses a different fitting and each bottle has to be borrowed with a usually non refundable deposit of around £25 and you can very soon see that we would need a large Bank balance and a gigantic trailer just to carry the different gas bottles we would need. Enter the life saver, refillable gas bottle. OK, I know that they are all refillable but only by going to a specialist depot or exchanging an empty one for a full one. Underslung fitted tanks have been around for years but our motorhome for example has no room underneath to fit one, however, a few years ago, specially adapted bottles that would fit in the usual gas locker with an internal float valve to limit the capacity to 80% to allow for heat expansion, started to appear. These have a fitting usually on the outside of the van for filling the bottles from an LPG pump in a filling station (sometimes known as GPL in Europe). The company mixes butane and propane depending on summer or winter for maximum efficiency and to avoid freezing. No standard though, we still have to carry four adaptors as each country has a different pump fitting! But much better than carrying different bottles. End of Technical Interlude. Where was I? oh yes, GAS. We were beginning to panic and thinking we would have to drive around a bit to find a filling station with LPG when, literally in sight of our destination which was just across the river, a BP station appeared with GPL, lets hope they haven’t run out. It was the most expensive GPL we had ever bought though, but as we take a maximum of 40 litres from empty and that will last us three weeks even if we run the heating, 10 cents extra a litre is not really going to break the bank and no, they hadn’t run out and the pump worked. So hooray! We get a cupper in the morning. We had visited Lagos last year but only stopped one night on route and didn’t realise just how good it was. Just on the outskirts of the town there is a small permanent camper stop by the side of the sports stadium with space for about twelve motorhomes with the usual dumping and water station. But out of season they allow the whole of the enormous car park to be occupied by motorhomes, some staying the whole season. The price is just €3 per night, pay at the machine or a man comes round each morning if you don’t have three euro coins. Water is €2 for 100ltr and they allow their showers to be used for a small charge and even a washing machine that only charges €2 per wash. It seemed to be working all day though as there were always about five bags of washing for people waiting their turn. The biggest bonus was free wifi which we could pick up in our van with our booster aerial on the roof, although it did take us three goes to find a spot with maximum signal. It’s at this point that I realise, while going through the camera, that we took very few pictures at Lagos which is unusual for Judy who is usually snapping away like mad. Note to selves, must take more pictures. The whole point of this Blog is to have an interesting account of our travels to look back on when we are in our Dotage. After a walk to Aldi about 3km away and back with two rucksacks full of shopping and cans of beer, we were sitting in the sun having a couple of the cans when a voice said “Hello I see you’re fellow Funsters, I’m Margaret, MAGS52 on the forum this is Shirley”. We of course said “Hi we’re Steve & Judy TheOldAgeTravellers” and so the conversation continued, the same as with “JJ” the other day at the Barragem. 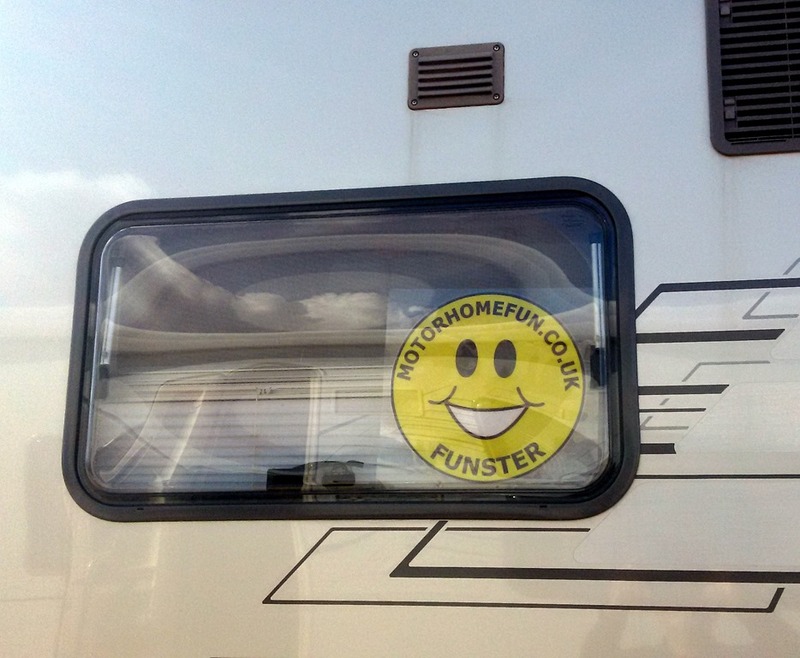 Because we have a French registered motorhome the Brits especially, are reluctant to start a conversation with us so we have a very large Funster badge in the window on each side of the van which soon breaks the ice. We also have a “GB” sticker beside the ”F” one on each number plate. We invited them in for drinks one evening and we had a great evening swapping stories. Margaret also does a blog LoveMotorHoming.com . It is a great site designed by her son who is a Web Designer and it prompted Steve to finally get down to a re-design of ours and move it to the WordPress platform. 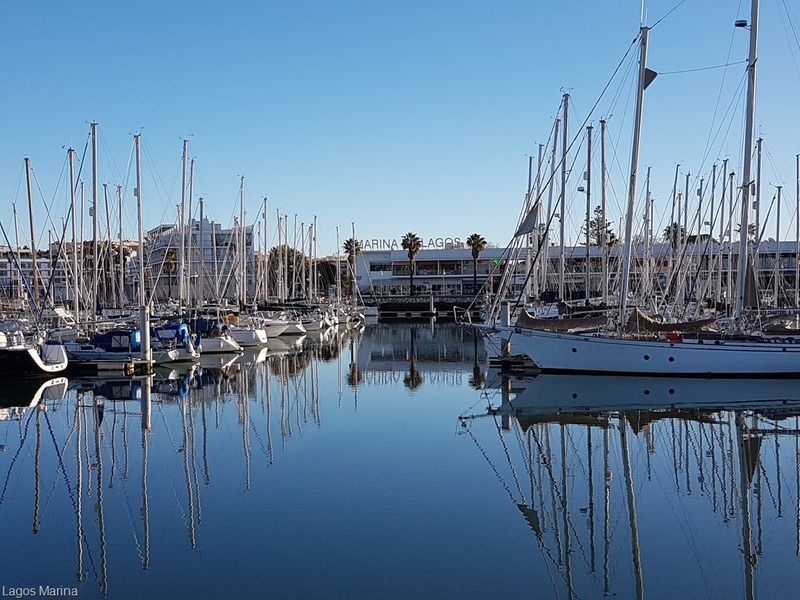 Lagos has a large Marina just across the river from the town with quite a few nice looking restaurants, Margaret & Shirley told us that Lazy Jacks was fun so we all went there for lunch on Wednesday and had their “Golden Years Special”, good food and very good value. After a nice walk in the hills behind the camper stop we walked past this Truck Hotel it was an amazing vehicle which had been confusing us for the whole time we had been there because it was about six meters high and no way could it possibly drive on the roads. While sitting reading in the sun that afternoon we looked up and it had collapsed down to this. What a shame we didn’t see it happening. Looking on the web, it can be hired by parties for surfing holidays. They also do trips which individuals can book. They are currently in Morocco. Don’t forget you can click on any photo to see an enlarged version. 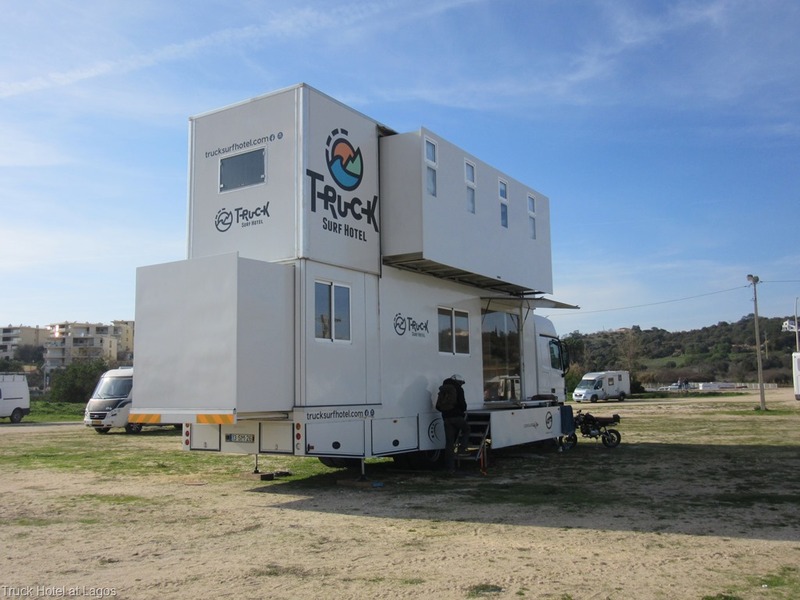 You can see more about this amazing truck at www.TruckSurfHotel.com. We still prefer travelling in our Motorhome though. We walked into the town which is very close with a very nice paved promenade for about three km along the river to an ancient harbour at the end and the Old Town which was like a walled Moroccan Medina. Walking a little further comes to a number of little coves between red earth Sea Stacks with arches or holes through them. One of these holes was about a meter up from the sand which Judy decided was too high for her. But while Steve was investigating she stepped back to avoid the sea but tripped on a large rock in the sand. Steve returned to find her lying on her back in the water, fully clothed struggling to get up, legs waving like an upturned bug. With a little assistance she managed and declared that nothing was damaged, except her pride perhaps. She had very wet trousers to walk about in for the rest of the afternoon though. A lady who had been sitting in the sand drawing, rushed over to help, which was nice. Later Judy found that she had grazed her hand and twisted her wrist but nothing broken thank goodness. Looking for another route we found some steps. 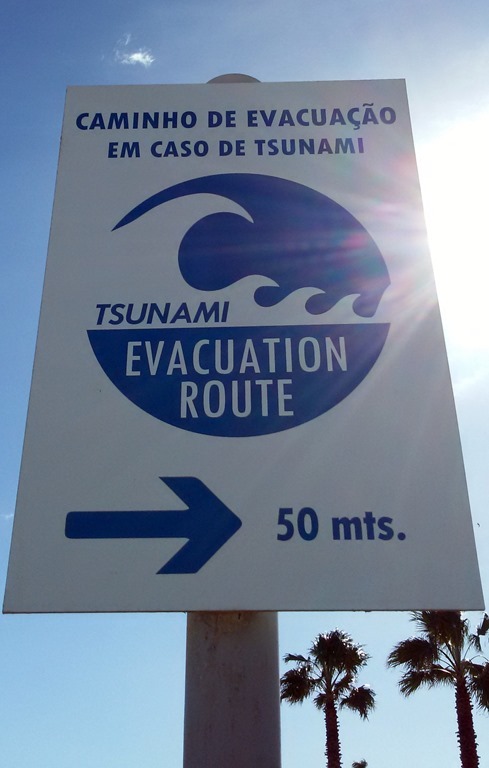 At the top we were confronted by this Tsunami Evacuation sign, just a little disconcerting! But I suppose this is the Atlantic coast so a Tsunami could be possible. Market day in Lagos, was in a covered hall and so much like the markets in Morocco very busy with a lot of jostling & local country people with a few of their vegetables spread on a sheet for sale. We bought a couple of jars of local honey, a turnip to go with the Haggis Judy had in the freezer and an enormous radish like vegetable about a foot long, they said it was like a mild radish. Judy is slicing it with the potato peeler with salad, very nice. After the market we walked across the footbridge to the harbour then right out to Lagos Beach which is about five miles of golden sands stretching all the way to Alvor the next town along. The only problem at this time is the cold breeze. Sunday, Monday and Tuesday we walked in the mornings and Steve worked on the Blog in the afternoons, we are trying to walk at least 10,000 steps a day, preferably more, which for us is about 6km, in a continuous walk as fast as we can comfortably. Steve especially wants to lose weight, at least 10kg so from last week we have been trying to follow the 5:2 diet,or in our case we prefer to do 4:3 with reduced calorie’s and no wine or beer on Monday, Wednesday & Friday. We have the time with no distractions while we are away to hopefully get a good head start to encourage us to continue it. On Sunday we had our first weigh-in so here’s hoping we can get a good result. We were rudely awoken by an alarm at 6:45am, it was the battery monitor.We had watched a couple of hours TV last night and hadn’t had much sun for the past week so the habitation batteries had been gradually going down. So we will have to move this morning Mags & Shirl had told us about a nice Camper Stop at Alvor only about 20 km but driving would put a fair amount back in the batteries and our Camper Stop book says that they have electric there so we can boost the batteries back overnight. So we quickly packed everything up and after emptying our waste got away by 9am heading for Alvor.